Our range of products include hmd60/70 humidity and temperature transmitters, hmt360 series intrinsically safe humidity and temperature tr, humidity and temperature transmitter for eto environments, hmp110 temperature probes, hmp60 humidity probe and hmt 330 humidity and temperature transmitters. The duct mounted Vaisala HUMICAP® Humidity and Temperature Transmitters HMD60 and HMD70 are designed for monitoring relative humidity and temperature in building energy management systems. The combination of high accuracy, stability and reliable operation, make these products the ideal choice for demanding applications. The duct mount HMD60 and HMD70 transmitters can also be used in many industrial humidity monitoring applications, where their stability and resistance to chemicals and dust are of great value. A useful feature of these duct mount transmitters is the ability to remove the electronics without removing the unit from the duct. The accuracy of the transmitters is simple to check using either the Vaisala HUMICAP® Hand-Held Humidity and Temperature Meter HM70 or the Vaisala HUMICAP® Humidity Indicator HMI41. Vaisala HUMICAP® Sensor for excellent accuracy and long-term stability, negligible hysteresis and resistance to dust and most chemicals. The entire HMT360 transmitter can be installed directly in explosive areas. It can withstand continuous exposure to potentially explosive environments that contain flammable gases or dust. Due to the microprocessor based electronics, options and accessories, the HMT360 series is truly flexible. Customers may specify the transmitter configuration when ordering the instrument, however changes in configuration can also easily be made in the field. The interchangeable probes enable fast and easy removal or re-installation when required. 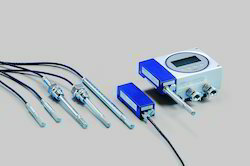 Calibration, for example, is easy to perform due to the modular structure. 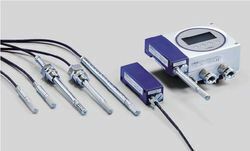 All calibration coefficients are included in the probe unit itself, which means that probes can be switched between transmitter bodies without losing the accuracy. In addition to the standard Vaisala HUMICAP® Sensor, an application specific, very chemically durable sensor is also available. The HMT360 transmitters are an investment; their rugged design, combined with trouble-free operation, ensure a long-term solution for monitoring humidity and dewpoint in explosive environments. Customized calibration and maintenance contracts for the HMT360 series are available on request. 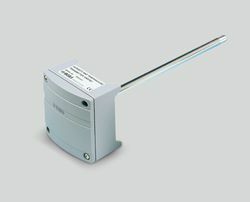 Humidity and Temperature Transmitter with a wide range of models for a variety of demanding applications are available. The HMP110 is a trouble-free and cost-effective humidity transmitter with high accuracy and good stability. It is suitable for volume applications or integration into other manufacturers’ equipment. The HMP110 is also suitable for glove boxes, greenhouses, fermentation and stability chambers, data loggers, and incubators. The probe cable has a screw-on quick connector for easy installation. Different cable lengths and accessories are available. HMP110 is suitable for batterypowered applications because of its very low current consumption. It also has a fast start-up time. The temperature measurement is a standard feature, dew point measurement is optional. Three standard voltage outputs are available. Robust design The aluminum body of the HMP110 is classifi ed as IP65. Thus, it survives rough conditions. The HMP110 has high chemical tolerance because of the HUMICAP® 180R sensor. Maintaining measurement traceability is easy using the HMP110R replacement probe. We send you a replacement probe, you detach the old probe and send it back to us. In this way the measurement is available at all times without interruptions. 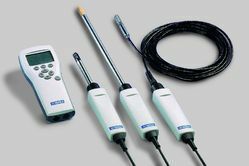 The HMP60 is a simple, durable and cost-effective humidity probe. It is suitable for volume applications, integration into other manufacturers’ equipment, incubators, glove boxes, greenhouses, fermentation chambers, and data loggers. The probe cable has a screw-on quick connector for easy installation. Different cable lengths are available. Also other compatible M8 series cables can be used. Accessories are available for different installation needs. The HMP60 is suitable for batterypowered applications because of its very low current consumption. There are two confi gurable voltage outputs with relative humidity, temperature or dew point scaling. Four voltage output ranges are available. The HMP60 is designed for extreme conditions. The aluminum body of the HMP60 is classifi ed as IP65. The probe has a sealed structure and the sensor is protected by a membrane fi lter and a plastic grid, or optionally by a stainless steel fi lter. The Vaisala INTERCAP® Sensor is interchangeable. No recalibration is required; the sensor can simply be replaced, also in the fi eld. The Vaisala HUMICAP® Humidity and Temperature Transmitter Series HMT330 is designed for demanding industrial applications where stable measurement and wide customization is important. The HMT330 series incorporates Vaisala's 30 years of experience in industrial humidity measurement. An updated, even more stable and chemical resistant HUMICAP® sensor is available, next to the proven reliable and accurate sensor. In environments with high concentrations of chemicals and cleaning agents, chemical purge option helps to maintain measurement accuracy between calibration intervals. Chemical purge involves heating the sensor to remove harmful chemicals. The function can be initiated manually or programmed to occur at set intervals. The HMT330 can be ordered with a large numerical and graphical display, which allows the user to clearly monitor operational data, measurement trends and 1-year measurement history. The optional data logger with real-time clock makes it possible to generate over four years of measured history, and zoom in on any desired time or time frame. The battery backup of the clock guarantees a reliable logging of measured data. The display alarm allows tracking of any measured parameter, with a freely configurable low and high limit. The recorded measurement data can be viewed on the display or transferred to a PC with Microsoft Windows® software. The transmitter can also be connected to a network with an optional (W)LAN interface, which enables a (wireless) Ethernet connection. A USB-RJ45 cable makes it easy to connect the service port of the HMT330 to a PC. Mains and DC power options, and several mounting accessories make the instrument easy to install. The HMT330 can have up to three analog outputs. Isolated galvanic power supply and relay outputs are also available. For serial interface the USB connection, RS232 and RS485 can be used. HMT330 is also capable in applying the MODBUS communication protocol and together with an appropriate connection option provides either MODBUS RTU (RS485) or MODBUS TCP/IP (Ethernet) communication. The HMT330 instruments are calibrated at six humidity points at the factory. A quick, one-point field calibration can be performed with the hand-held HM70 meter. A two-point field calibration can be performed with the HMK15 salt bath calibrator in a controlled environment. The transmitter can be sent to Vaisala for recalibration. Accredited calibrations and maintenance contracts are also available. * Vaisala HUMICAP® Sensor for excellent accuracy and long-term stability, negligible hysteresis and resistance to dust and most chemicals. The Vaisala HUMICAP® Humidity and Temperature Probe HMP155 provides reliable humidity and temperature measurement. It is designed especially for demanding outdoor applications. The HMP155 has the proven VaisalaHUMICAP®180R sensor that has excellent stability and withstands well harsh environments. The probe structure is solid and the sensor is protected by default with a sintered teflon filter, which gives maximum protection against liquid water, dust, and dirt. Measuring humidity reliably is challenging in environments where humidity is near saturation. Measurements may be corrupted by fog, mist, rain, and heavy dew. A wet probe may not give an accurate measurement in the ambient air. This is an environment to which Vaisala has designed a patented, warmed probe for reliable measuring. As the sensor head is warmed continuously, the humidity level inside it stays below the ambient level. Thus, it also reduces the risk of condensation forming on the probe. With its fast response time, the additional temperature probe for the HMP155 is ideal for measurement in environments with changing temperatures. The new membrane filter speeds up the RH measurement. Protecting the sensor from scattered and direct solar radiation, and precipitation will increase its lifetime. Thus, Vaisala recommends installing the HMP155 in one of the following radiation shields: DTR503, DTR13, or a Stevenson screen. 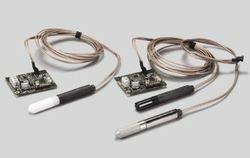 For the additional temperature probe, an installation kit is available to be used with DTR502 radiation shield. Vaisala INTERCAP® Humidity and Temperature Transmitter Series HMDW80 measure relative humidity and temperature in various building automation applications. Transmitters combine easy installation and reliable operation with a low requirement for maintenance. The versatile HMDW80 series includes transmitters for wall and duct mounting, IP65-classified transmitters for humid areas, and transmitters with a radiation shield for outdoor use. It also includes temperature-only transmitters and transmitters with an optional display. Calculated humidity parameters – dew point temperature, wet bulb temperature, and enthalpy – are also available. HMDW80 series transmitters are optimized for easy installation. There are no loose parts, screws are retained in the enclosure, all connectors are clearly labeled, and the connectors are within easy reach. 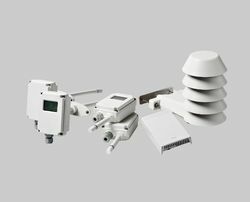 The duct mount transmitters are well suited to a variety of duct sizes, the outdoor transmitters can be mounted directly onto a wall or pole without any extra accessories, and the wall mount transmitters can be installed without the need to make holes in the transmitter enclosure. HMDW80 series transmitters require minimal maintenance thanks to their excellent sensor stability and high-quality materials. The Vaisala HUMICAP® Humidity and Temperature Transmitters HMT120 and HMT130 are designed for humidity and temperature monitoring in cleanrooms and are also suitable for demanding HVAC and light industrial applications. The HMT120/130 incorporates Vaisala HUMICAP® technology that measures relative humidity accurately and reliably. The Vaisala HUMICAP® is resistant to dust and most chemicals. The transmitter enclosure is optimized for use in cleanrooms. The smooth surface of the enclosure makes it easy to clean and the enclosure material is chosen to tolerate purifying agents. Furthermore, the cabling can be done through the back wall of the transmitter. 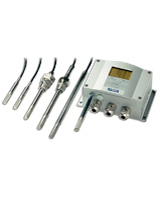 The HMT120/130 transmitters use a fully interchangeable relative humidity probe. The probe can be easily removed and replaced with a new one without having to adjust the transmitter, which allows for easy and quick recalibration of the transmitter. The probe can be adjusted using one of Vaisala’s portable meters as a reference. Also available is a constant output probe with fixed RH and T output for convenient inspection of the monitoring system and signal transfer line. The HMT120 and HMT130 transmitters are available as wall mounted or with remote probe. 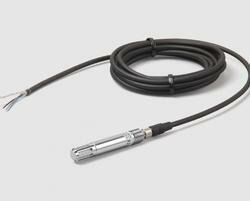 For high temperature applications or where space is limited, the remote probe is ideal. The transmitters come with an optional LCD display, which shows the measurement results of selected parameters in selected units. The parameters are displayed simultaneously at two separate rows on the display. Wall-mounted Vaisala HMW90 Series HUMICAP® Humidity and Temperature Transmitters measure relative humidity and temperature in indoor HVAC applications, where high accuracy, stability, and reliable operation are required. The flexible HMW90 series offers a variety of options and features. 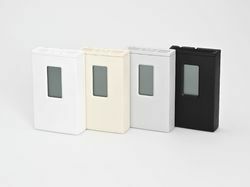 Transmitters include a display and a sliding cover with either an opening for the display or a solid front. Both analog and digital output options, including special scalings and calculated parameters, are available. 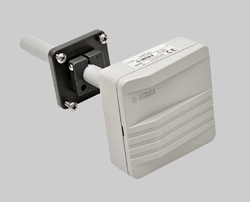 HMW90 series transmitters are quick and easy to install. The wiring is connected through the back plate and the electronics with the sensors can be snapped on easily after the wiring is complete. The transmitter is configured using dip switches, which are accessible when the enclosure is open. The introduction of digital (BACnet/ Modbus) communication to field level devices brings many advantages. For example, all sensors can be centrally accessed and their performance can be easily monitored. Wiring is simple when multiple sensors are installed on the same bus. Sensors can be set up using standardized tools, and the system can be enlarged with additional sensors quickly and conveniently. In addition, parameters influencing measurements, such as pressure or site elevation, can be centrally set and updated. Vaisala HUMICAP® Humidity and Temperature Transmitter Series HMDW110 measure relative humidity and temperature in multiple HVAC applications. The series includes transmitters for duct mounting, IP65-classified wall transmitters, and outdoor transmitters with integrated radiation shields. The cost-efficient HMDW110 series transmitters are equipped with trusted HUMICAP® 180R sensors. The sensor’s superior long-term stability minimizes maintenance needs throughout the transmitter’s lifetime. If necessary, the transmitter can be field-calibrated using either an HM70 Hand-Held Humidity and Temperature Meter, or a PC connection. HMDW110 series instruments are individually adjusted and delivered with a calibration certificate. The factory calibration is traceable to NIST. 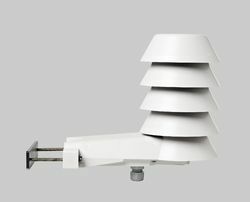 The integrated radiation shield of the outdoor models HMS110 and HMS112 enables unrivaled measurement performance. It reduces the impact of sunshine on temperature and humidity measurements, and ensures measurement accuracy in outdoor conditions. 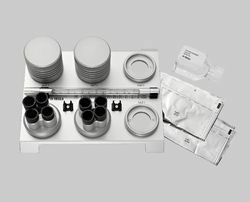 The most popular control parameters in free cooling – dew point temperature, wet bulb temperature, and enthalpy – are available as output parameters. The HMD110 and HMW110 transmitters can be ordered with a catalytic HUMICAP® sensor HUMICAP® 180VHP. The catalytic sensor improves stability especially in hydrogen peroxide sterilized environments where repeated condensation is expected. An optional panel display can be added for remote monitoring. Transmitters can be installed into difficult-to-reach locations, while measurement data can be read from a more convenient spot. * Default output parameters are relative humidity and temperature. Dew point temperature, wet bulb temperature, and enthalpy outputs selectable with a PC connection. Vaisala HUMICAP® Humidity and Temperature Transmitter Series HMS110 are designed for demanding outdoor measurements in building automation applications. These ±2% transmitters include an integrated radiation shield to reduce the influence of solar radiation on temperature and humidity measurements. HMS110 transmitters are equipped with the trusted HUMICAP® 180R – a robust, general-purpose humidity sensor that functions well in high humidity. The sensor’s superior stability ensures long-lasting accuracy and minimal maintenance throughout the transmitter’s lifetime. The integrated radiation shield allows unrivaled measurement performance, reducing the impact of sunshine on temperature and humidity measurements and ensuring measurement accuracy in outdoor conditions. HMS110 transmitters are easy to install. They can be mounted directly onto a wall or pole without any extra accessories. There are no loose parts, screws are retained in the enclosure, all connectors are clearly labeled, and the connectors are within easy reach. The HUMICAP® sensor’s excellent long-term stability and high-quality materials ensure minimal need for maintenance. If necessary, the transmitter can be field-calibrated using either an HM70 Hand-Held Humidity and Temperature Meter, or a PC connection. * Default output parameters are relative humidity and temperature. Dew point temperature, wet bulb temperature, and enthalpy outputs selectable using dip switches. Vaisala INTERCAP® Humidity and Temperature Transmitter Series HMS80 are designed for outdoor measurements in various building automation applications. 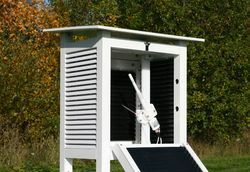 These ±3% transmitters include an integrated radiation shield to reduce the influence of solar radiation on temperature and humidity measurements. HMS80 transmitters are easy to install. They can be mounted directly onto a wall or pole without any extra accessories. There are no loose parts, screws are retained in the enclosure, all connectors are clearly labeled, and the connectors are within easy reach. For fast and convenient configuration, the most popular control parameters in free cooling control – dew point temperature, wet bulb temperature, and enthalpy – are selectable using dip switches. HMS80 series transmitters require minimal maintenance thanks to their excellent sensor stability and high-quality materials. If necessary, the INTERCAP® sensor can easily be replaced in the field with minimum downtime. The Vaisala HUMICAP® Hand-Held Humidity and Temperature Meter HM70 is designed for demanding humidity measurements in spotchecking applications. It is also ideal for field checking and calibration of Vaisala's fixed humidity instruments. The HM70 incorporates the latest generation of the Vaisala HUMICAP® Sensor. It is reliable and has better than ever long-term stability. Additionally, it has a sensor that copes well with chemical interference and provides accuracy that lasts in demanding conditions. The chemical purge option maintains measurement accuracy in environments with high concentrations of chemicals. The sensor preheat option reduces measurement delays as it keeps the sensor dry when the probe is inserted into hot and humid processes. The HMP75 is a general purpose probe whereas the HMP76 is a long, stainless steel probe especially suitable for spot-checking in ducts. The HMP77 is a small probe at the end of a 5-meter cable. The probe is ideal for difficult-to-reach areas and for on-site calibration of Vaisala's process transmitters. In addition, the HM70 supports the use of Vaisala's dew point, carbon dioxide and moisture in oil probes, allowing measurements in several multiparameter applications. The optional MI70 Link Windows® software and the USB connection cable form a practical tool for transferring logged data and real time measurement data from the HM70 to a PC. The Vaisala HUMICAP® Structural Humidity Measurement Kit SHM40 is an ideal solution for the borehole method. The starter kit is comprised of an HMP40S probe, HM40 indicator and accessories for the borehole method in a weather-proof case, optimized for use in harsh and humid construction sites. Additional accessories for the SHM40 can be used to prepare a moisture measurement hole in fresh concrete. Pre-formed holes eliminate the need for drilling and the risk of damaging heating elements or tubing embedded in the concrete. 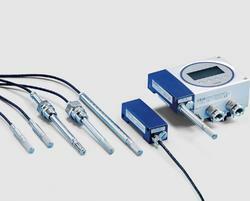 HMP40S measurement probes are interchangeable. 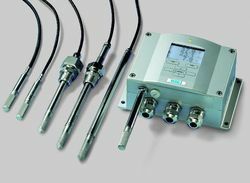 The probes connect easily to the HM40 indicator with a snap-on connector enabling convenient use of multiple probes with one indicator. The measurement data can be displayed in numeric, statistic or graph views. The HMP60 is suitable for battery powered applications because of its very low current consumption. There are two configurable voltage outputs with relative humidity, temperature or dew point scaling. Four voltage output ranges are available. The HMP60 is designed for extreme conditions. The stainless steel body of the HMP60 is classified as IP65. The probe has a sealed structure and the sensor is protected by a membrane filter and a plastic grid, or optionally by a stainless steel filter. The Vaisala INTERCAP® Sensor is interchangeable. No recalibration is required; the sensor can simply be replaced, also in the field. 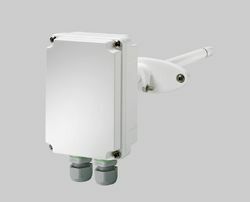 * Reliable: Latest generation HUMICAP® 180R sensor for best stability and high chemical tolerance. IP65 metal housing. HMP110 is suitable for battery powered applications because of its very low current consumption. It also has a fast start-up time. The temperature measurement is a standard feature, dew point measurement is optional. Three standard voltage outputs are available. The stainless steel body of the HMP110 is classified as IP65. Thus, it survives rough conditions. The HMP110 has high chemical tolerance because of the HUMICAP® 180R sensor. The Vaisala HUMICAP® Humidity Module HMM100 is an open frame module for integration into environmental chambers. The modules provide a single analog output channel for relative humidity (RH) or dew point (Td). Two probes are available, one made of plastics, the other of stainless steel. Several cable lengths up to 3 meters are available. 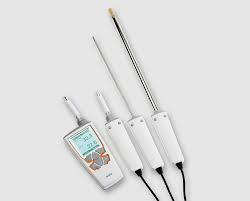 Both the probes have the Vaisala HUMICAP® 180R sensor which ensures excellent measurement accuracy. The HMM100 probe works in freezing conditions (-70 °C) and also in temperatures up to +180 °C. The HMM100 is easy to install and the probe can be freely placed in a test chamber as the speed of airflow does not affect the measurement. Compared to psychrometers, the HMM100 is practically maintenance free. There is no wick that needs changing and there is no need for a water tank or water pump. Thus, environmental stress screening can be done reliably. The accessories available are a component board mounting bracket with a lid, probe clamp, USB-cable for service use, a module housing and a probe mounting flange. · Vaisala Service Centres offer accredited calibrations for humidity, temperature and barometric pressure. No measuring instrument stays accurate by itself. It is essential that the functioning of an instrument is periodically checked against a reference. Vaisala has developed the Vaisala Humidity Calibrator HMK15 to make calibration and spot checking of humidity probes and transmitters easy and reliable. The operating principle of the HMK15 is based on the fact that a saturated salt solution generates a certain relative humidity in the air above it. The reading of the humidity probe or transmitter can then be adjusted accordingly. Many leading laboratories use this generally accepted and reliable method to calibrate humidity instruments. Usually two or three different salt solutions are used. Salts are chosen according to the application. The HMK15 can be ordered with certified and pre-measured salts. A sample calibration is made from each batch in Vaisala’s Measurement Standards Laboratory (MSL). The HMK15 can be ordered with a thermometer, which is used for measuring the temperature during the calibration. It can also be used for checking the temperature measurement accuracy of the transmitter. The thermometer can contain either mercury (accuracy ±0.3 °C (±0.54 °F)) or red capillary fluid (accuracy ±1.0 °C (±1.8 °F)). Vaisala’s Measurement Standards Laboratory is a FINAS accredited calibration laboratory. FINAS is a member of the EA (the European Cooperation for Accreditation). The HM40 is a compact and portable humidity meter at hand everywhere you go. It is an ideal spot checking tool that is easy to use and provides reliable measurement. It can be used for a wide range of various portable measurement applications. According to a user's needs, the meter is available in two models: standard and with a remote probe. The HM40 includes a user-friendly, large graphical display and easy-to use push buttons. The user interface is simple and intuitive to use, and available in 10 languages. Also, many other settings can be modified by the user to best suit his individual needs. In addition to relative humidity and temperature, the HM40 provides five calculated humidity parameters, all available in both metric and nonmetric units. The meter is powered by 2 AA-sized batteries. An external NiMH battery recharger with USB connection and rechargeable NiMH batteries are offered as an option. Each HM40 comes also with a handy belt clip and a case. The calibration of the HM40 is easy: just send the meter back to a Vaisala Service Center for recalibration or simply plug in a recently calibrated interchangeable HMP113 measurement probe. Alternatively, the HM40 can be user calibrated on site using a humidity reference, e.g. the Vaisala Humidity Calibrator HMK15.